I have that first edition paperback, as well as the omnibus, but since I several other paperback F&GM paperbacks, I chose not to shell out big bucks for the more recent collections. Nice review. Two classic works! 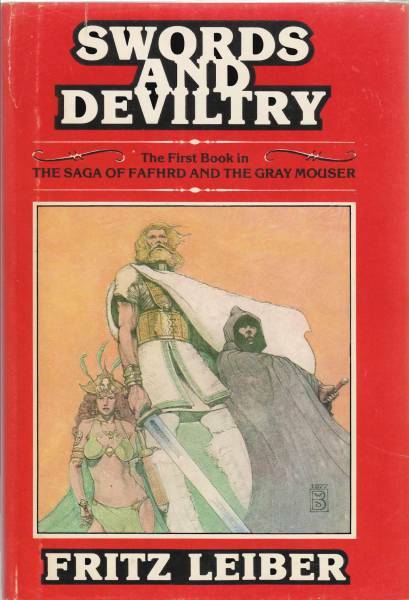 I read all the Fafhrd And The Gray Mouser stories. Wonderful stuff! 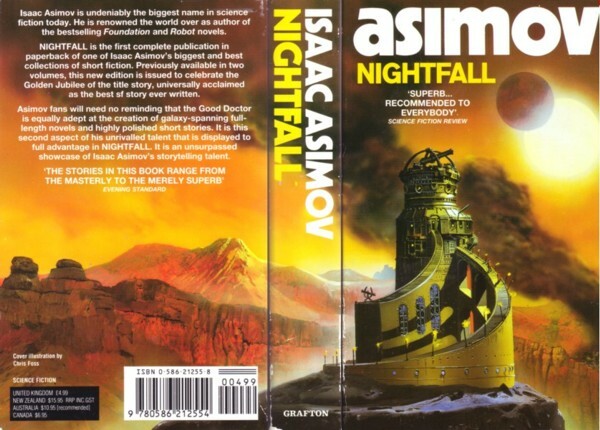 I read Asimov avidly in the Sixties, but his work in the Seventies held less appeal to me. Thanks, gentlemen. Yes, I have to argue with myself before making any purchase at the moment, and while I'd like the supplementary materials, I'd also like them to also be available to people who can't drop $75 on a single book. Ah, well. 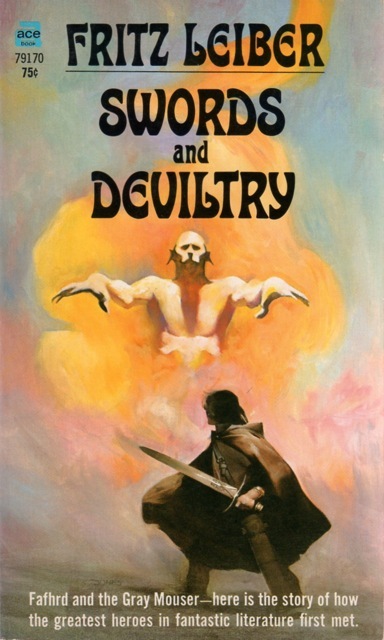 Even in the '70s, some of his stories (up to the "The Bicentennial Man" and some of the other shorter works) were worthwhile, even if the novels which come to mind, not so much. The autobiographies were good, if seemingly a bit more revealing in some ways than I think he realized, at least about his family's dynamics. Or so I hope. 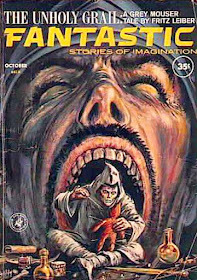 And the pop-science work and many of the anthologies were definitely good or better. You know, despite all the talent at work on these books' covers, the only ones above I'm fully satisfied with are the Mignola cover for the White Wolf omnibus, and the Paul Lehr and good typography balance on the Fawcett paperback for the Asimov collection. Even the Jones (first edition and, reframed, subsequent Ace editions, and the 1970 FANTASTIC) and Barlowe (Gregg Press) covers, which are handsome pieces of illustration, don't make the most effective covers to me...though the version of the Barlowe used on the Berkley edition of NIGHTS BLACK AGENTS is much better thus. Even the handsome UK NIGHTFALL cover isn't actually depicting what's about to occur correctly, for what it's worth. 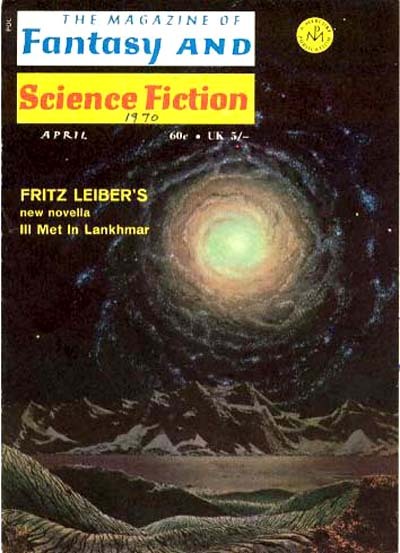 And the Bonestell on the F&SF is typically handsome, but probably on this issue as the result of having to rush scheduling of the Leiber novella to accommodate the book's publication date...no time to commission a painting for the story. 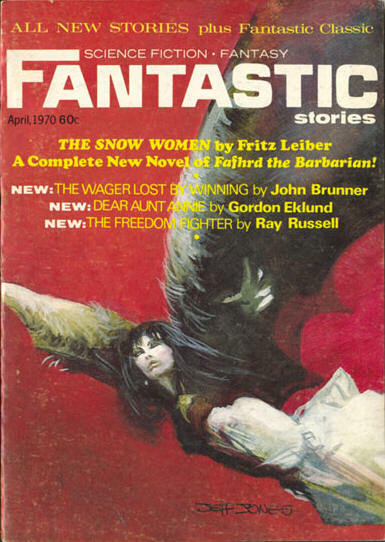 (Or in consideration of the truism that sf covers, or at least astronomical ones, would outsell fantasy covers on F&SF...on FANTASTIC, the only circulation spikes were apparently driven by advertising the latter-day Conan stories that magazine would run in the '70s). 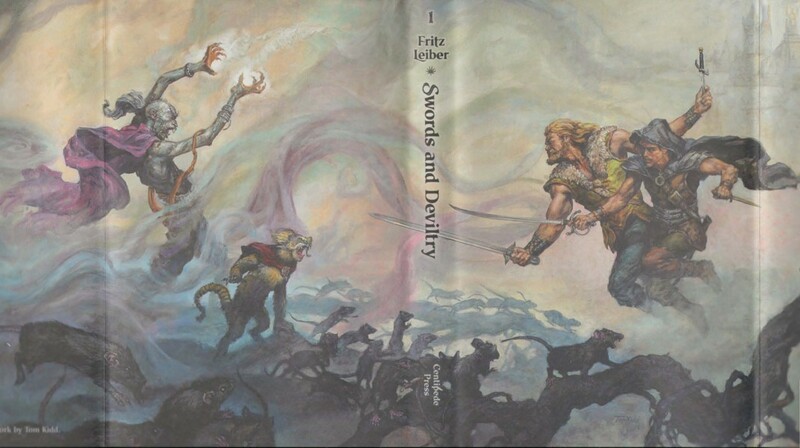 Todd, I must have been twelve or thirteen when I first encountered Leiber's work via the Fafhrd/Gray Mouser story "The Bleak Shore." I had been an active reader but this was something far beyond anything I had previously experienced. (The next time I was so wowed by an author was when I read Avram Davidson's "The Necessity of His Condition.") 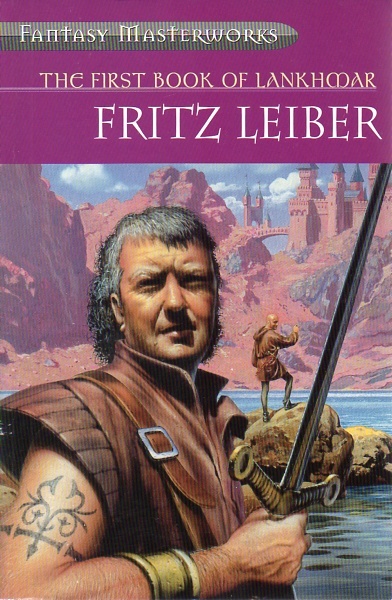 "The Bleak Shore" was not Leiber's best story but it has remained with me for half a century and was one of my main gateways to adult literature. 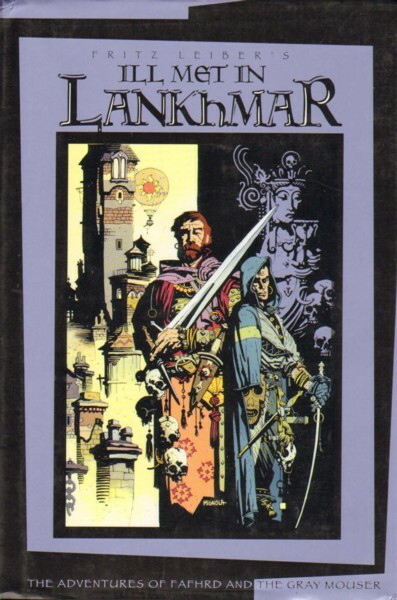 Anyway, I agree -- "Ill Met in Lankhmar" is the best of all the Lankhmar stories. Jerry--I'd read something by Leiber, enough to know his name, when I picked up the first back issue I'd read of F&SF and found his next F&GM story after "Ill-Met in Lankhmar", "The Price of Pain-Ease" and was hooked. I would've been just 13yo, myself, the Golden Age by some reckoning (some insist twelve). Did you read "The Bleak Shore" in D. R. Bensen's THE UNKNONW, perhaps? I'm not the one to credit anything to Fischer vs. Leiber, Rich...Leiber himself noted somewhere that, aside from the devising together the background and circumstances of the two characters, that some segment of "Adept's Gambit" (if I'm not mistaken) was also Fischer's work. Though I'd like to see or hear (it might've been a recording) that citation again, I'll admit. 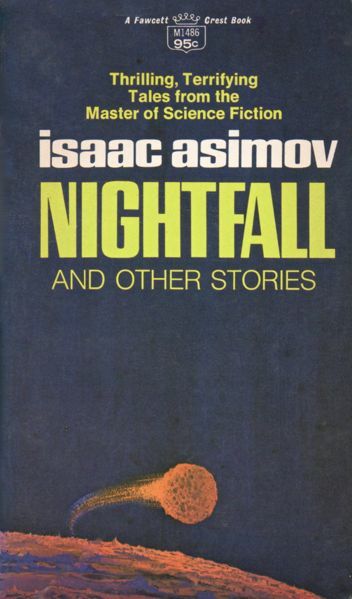 Nearly every non-joke story in the Asimov book is, frankly, stronger than "Nightfall"...it's not the monument that it's often credited with being...and I'd agree, the original collections not being available is a shame. Though my point was, it's odd that these stories we cite weren't included in the These Are My Recent Stories collections we cite, along with their contemporaries. 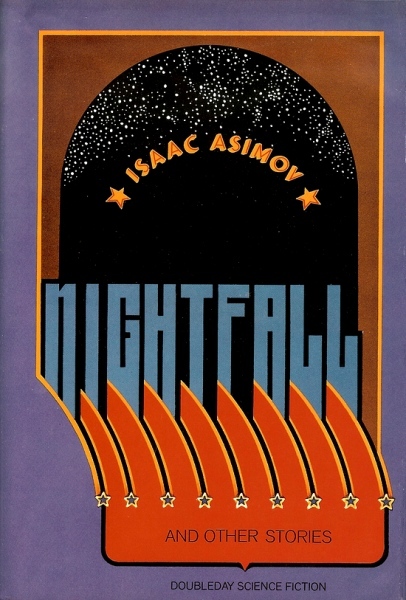 I can see why, with "Nightfall", but it's less clear to me when not "Hostess" or "C-Chute"...perhaps they were still in print in anthologies, but that still seems an odd choice on Asimov's part, or Doubleday's. 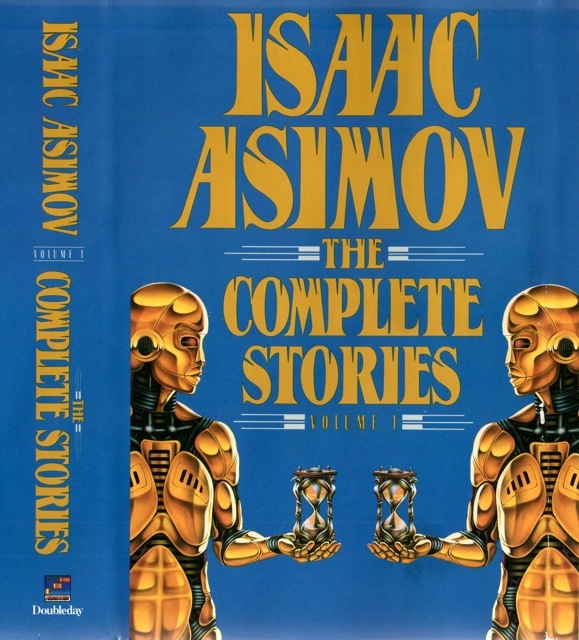 And while the fixup that is THE FOUNDATION TRILOGY can be considered a story collection, I'd say the robot stories books (including THE REST OF THE ROBOTS and eventual later additions) are the only "real" if thematically limited "survey" books Asimov published before NAOS. At least they finally picked up that money on the table.